By now, anyone who has followed the news coming out of Tunisia knows the timeline of events that culminated in Ben Ali fleeing the country and leaving his party struggling to regain control. But the end of Ben Ali’s era did not create a definite alternative. There is no consensus among those opposed to the old regime, and the discord is evident in the struggle to give the revolution a name. The only point of agreement is that Mohamed elBouazizi’s act ignited the protest that evolved into a revolution, which could be very useful in understanding the impetus of this revolt. Immediately after the departure of Ben Ali, those with access to media and tools that shape public opinion rushed to romanticize the uprising by calling it “the jasmine revolution.” While jasmine is Tunisia’s national flower, that name hardly represents the context and aspiration of the uprising and certainly could not have been on the mind of the person who sparked it, Mohamed elBouazizi. elBouazizi represented the class of people who needed an immediate and urgent change in the country. Educated young men and women living in the systematically deprived region and economically marginalized communities of the inner provinces. These people struggle to keep up with the pace of development that has split the country into many Tunisias: the filthy rich, the middle class, the poor, the very poor, and the destitute. elBouazizi faced two forces: an oppressive, out of touch, oblivious ruling elite and ambitious cultured soul dreaming of a dignified future. The elite stripped him of his dreams and his dignity and above all, reminded him of his utter weakness before the brutality of a paternalistic regime. His livelihood was confiscated, his dignity was destroyed, and his manhood was erased by Ben Ali’s security forces. Is it possible to say that, during the very same moment this was happening to him, he thought of a jasmine revolution? I doubt it. What could have been on his mind then and in other times is how to live with dignity and without fear. During the confrontation with the police officers, he would have been thinking of ways to conquer his fear, a fear that paralyzed the Tunisian society since independence from the French colonizers. The stories of individuals who followed his footsteps in Tunisia, Algeria, Mauritania, and Egypt speak to the same issues: the brutality of poverty, the inhumanity of oppression, the value of human dignity, and the determination to defeat fear. These events point to the fact that what happened in Tunisia was a revolution to preserve that which is more important than life itself: dignity. elBouazizi’s act, the mechanism igniting the revolution, cannot and should not be interpreted as a suicidal impulse seeking escape into the unknown from a frightening reality. Rather, it is about overcoming fear and telling the world about it. After all, if the aim of suicide is to die, then there are many other less painful ways of dying than to burn oneself alive. The act undertaken by Mohamed elBouazizi defies logic, transcends religious teachings, and exceeds all expectation. It acquired the uniqueness and the significance of singular events that give meaning, that communicate a particular state of mind, that become paradigmatic by and in itself. With that said, the act in itself cannot (and should not) be replicated to produce the same results, for it was meant to ignite, kindle, awaken, and provoke—and it has done so beyond anyone could have imagined; but it was not meant to solve. It was a spark, not a solution. 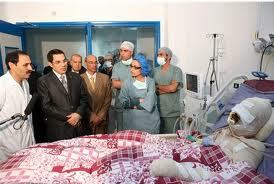 *Photo: Mohamed el-Bouazizi visited by Ben Ali after demonstration intensified. **SOUAIAIA is an associate professor teaching for International Programs, Religious Studies, and College of Law at the University of Iowa.